Hmm, more ways to use chili? Oh yes my friend, so many ways. I often get asked what my go to meal is, well it’s whatever is leftover reused. I’m sure everyone does this, you make the food and later in the week you have leftovers. Leftovers are wonderful, especially when they don’t taste like leftovers. Chili is wonderful for this, it works in lots of yummy comfort food type meals. So this would be my week. First make chili for dinner, mm, yummy. Eat that with some bread, salad, whatever. Good stuff. The next day for lunch or dinner you have two options depending on your time. Mac and Cheese with Chili, or Chili Salad. 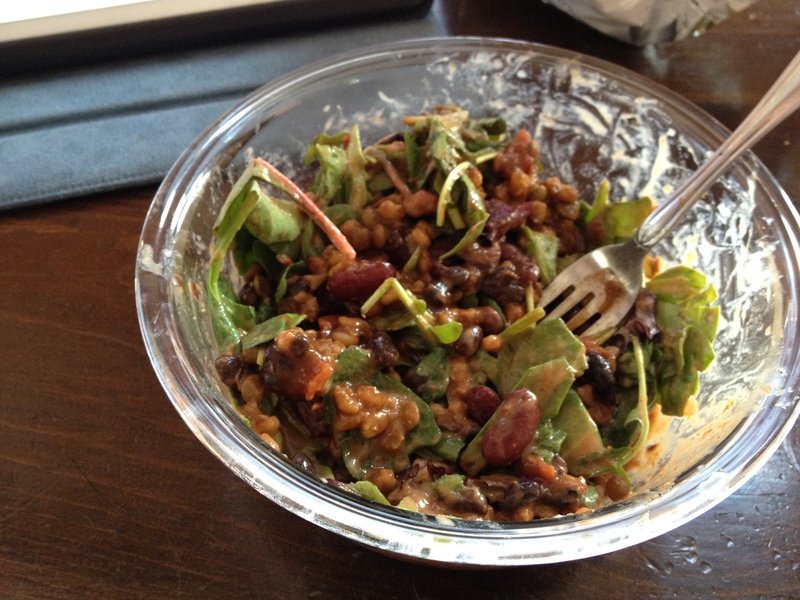 Chili Salad I often made and took to work with me, but it is also hearty enough to eat for dinner at home if you need something quick. Mix everything except the greens and chili in a bowl. Note: If I’m at home I heat the chili a little before I put it on the salad, if I’m not I eat it cold which is also super tasty. I hate salad and I even ate this one! And don’t tell anyone but I enjoyed it!